This backyard entertainment area was recreated with multi-level stone patios, granite walls and raised planters, vibrant plantings and LED lighting. At our initial site visit there was a very large two level deck off the back of the house which led to an above ground pool. 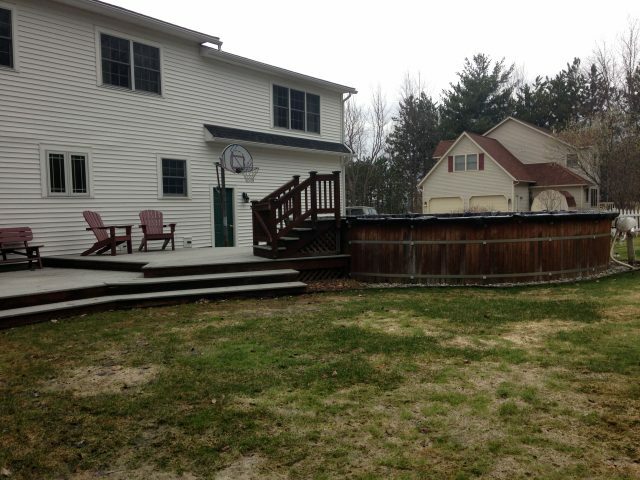 The homeowners used the deck for some outdoor dining, but their children are getting older and the pool was rarely used. 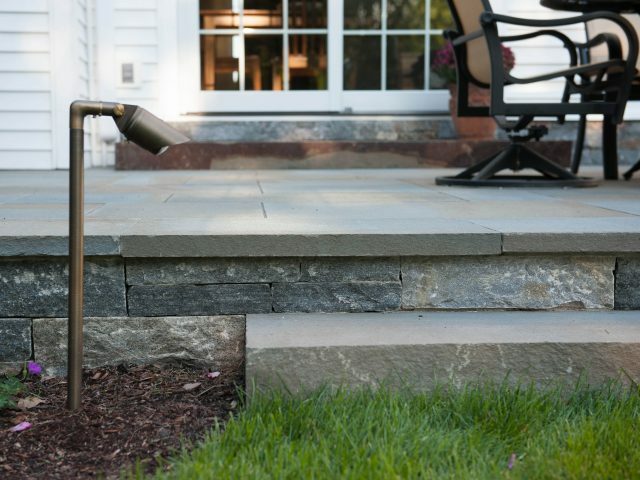 These large and little used elements consumed the back yard and made their outdoor space feel tight and unwelcoming. 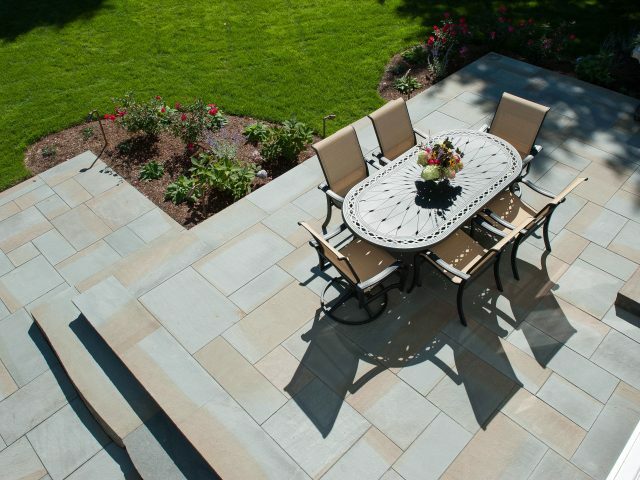 A more modern and functional outdoor entertaining space for dining and gathering was the clients goal. There were several discussions about renovating the deck, but ultimately they were open to other options. Not only did the outdoor living space need to be addressed, but the site also had some major drainage issues which needed to be dealt with. Run off from the neighboring golf course caused their yard to be extremely wet whenever it rained throughout the year, and almost unusable in the spring. After multiple discussions and concept drawings, we decided to move forward with a two tiered patio that would provide two separate entertainment spaces, yet still have them interconnected for more use options. The upper level of the patio was intended to be mostly used for dinning and the lower patio area is meant for relaxing near the fire or enjoying time in the sun. 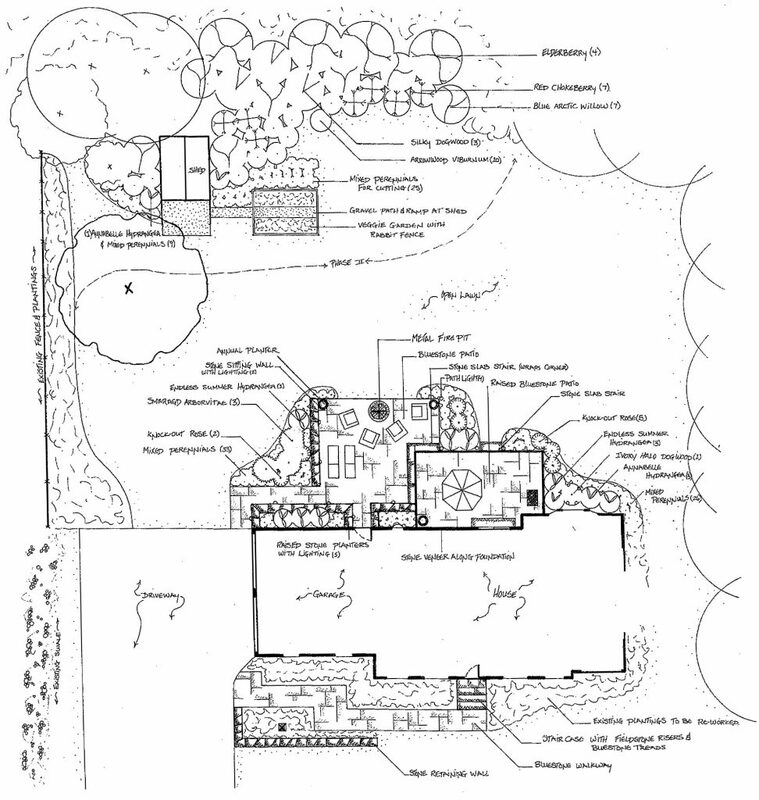 To create the upper patio a low stone wall was first constructed at the perimeter of the space. 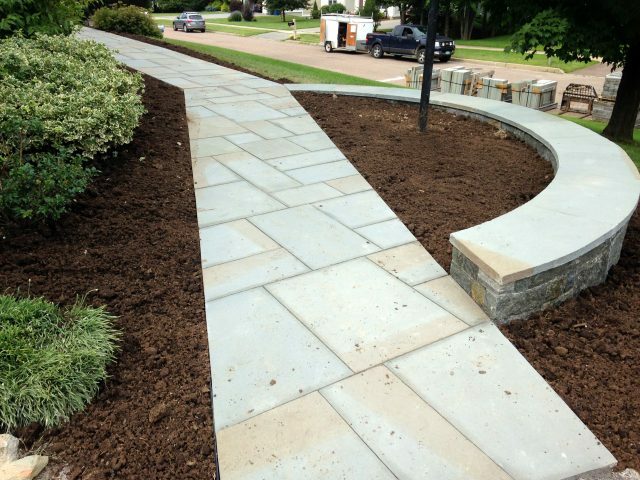 This was built out of Adirondack Granite and has hues of gray, blue and brown with flecks of Micah and Garnet. 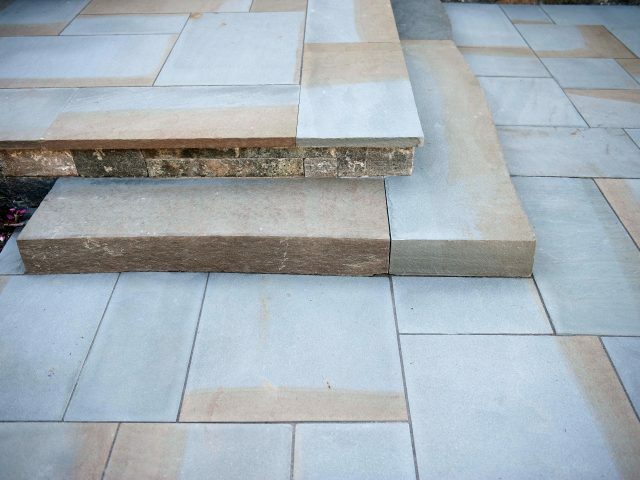 The interior of the wall was filled with base stone and compacted in lifts to ensure that the patio stone laid on top would not heave over time. 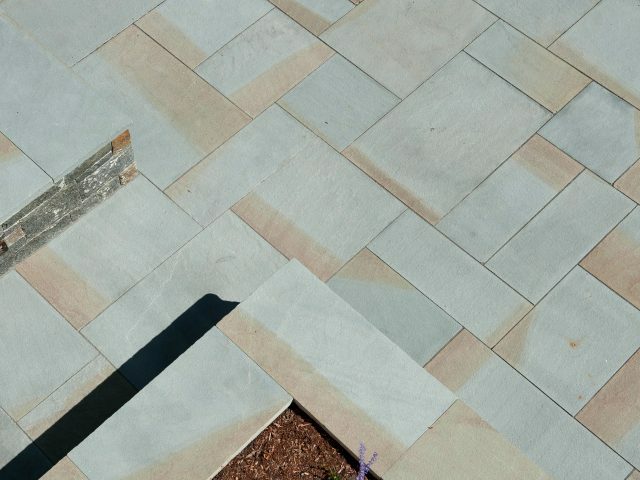 Once the base and screed were prepared, dimensional Thermal Bluestone was laid in a random pattern over the area and the space was edged by 1’x3’ Bluestone pieces. 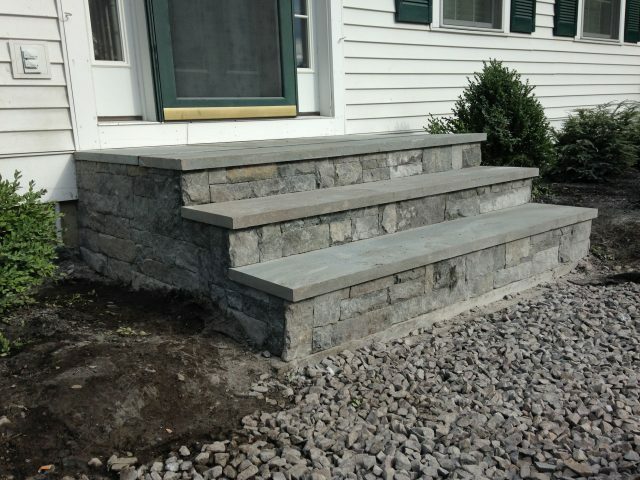 A large 8’ stone slab step was placed outside the sliding glass door to provide access from the house to the upper patio. 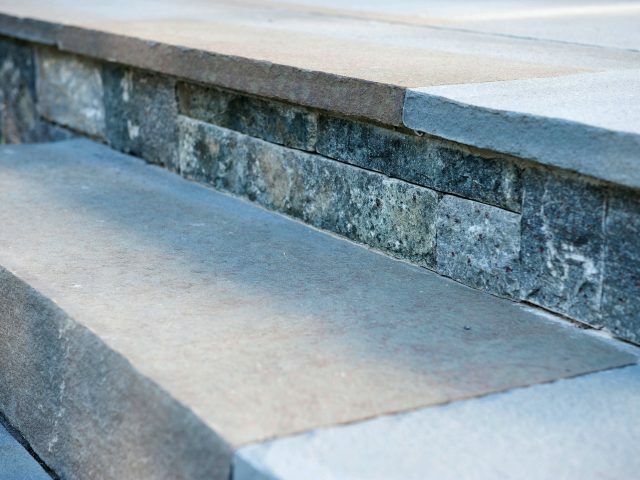 Access to the lower patio was given by the use of large bluestone slab steps which wrap one of the corners of the upper patio. 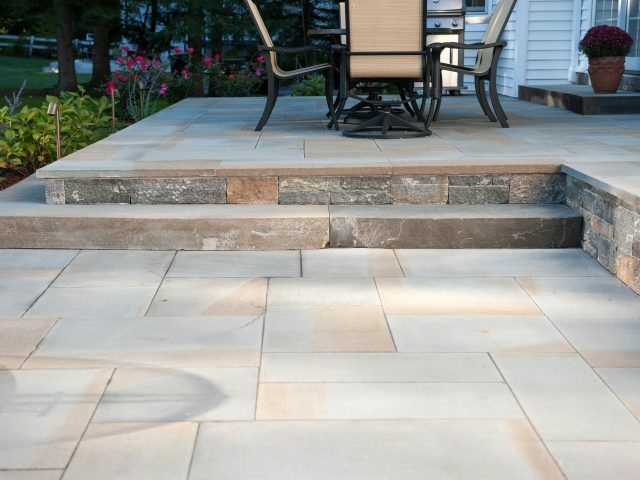 This lower patio is also constructed of dimensional Thermal Bluestone set in a random pattern. 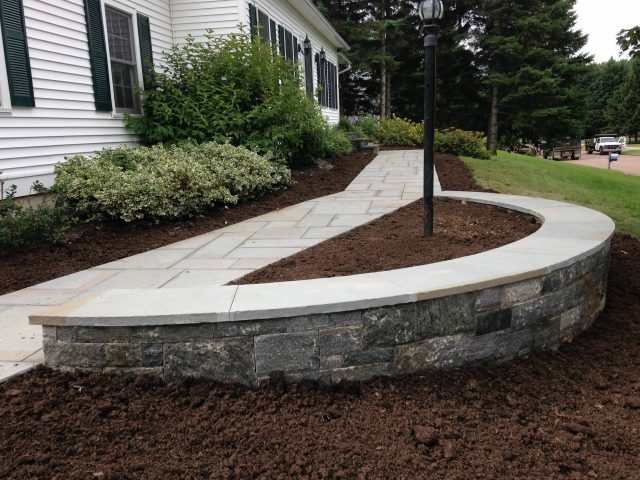 Raised Adirondack Granite planters run the length of the foundation and were capped with 1’x 3’ Bluestone that runs directly into the patio. 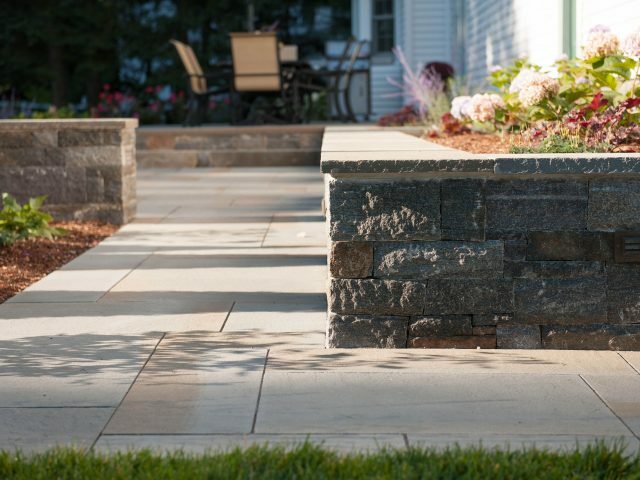 The lines are clean and simple and provide a seamless transition from planter/sitting wall to patio. These raised planters were planted with a mix of Endless Summer Hydrangea, Russian Sage and Heuchera ‘Stormy Seas’. 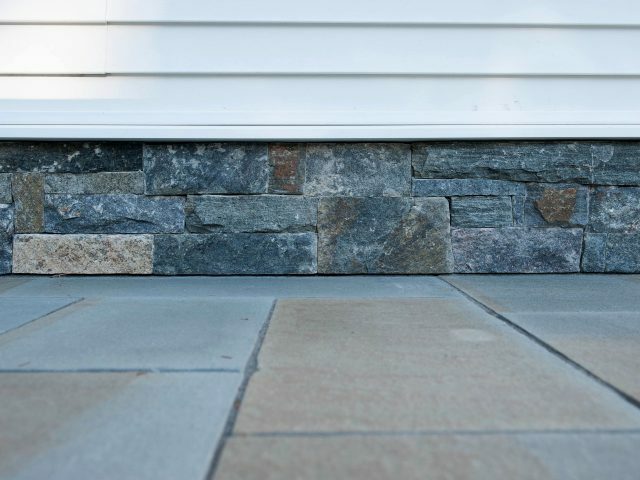 The cool colors of the plant material compliment the grays and blues of the stone and help to soften the buildings white siding. 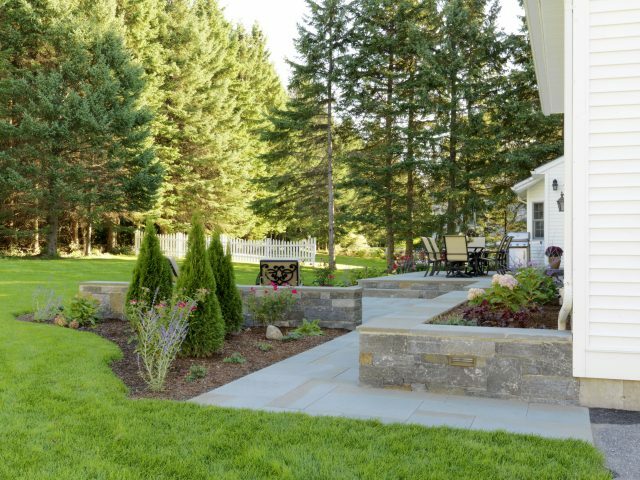 A walkway leading from the driveway to the patio runs along the base of these raised granite planters and provides access to the space from the front yard. 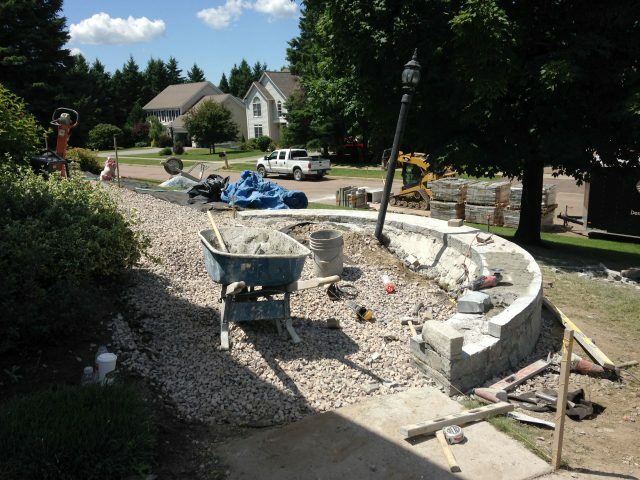 An additional sitting wall was added to help define the lower patio and to cozy up the space. Behind this wall is a planting which contains Arborvitae. That will provide some year round privacy screening from the neighbors. 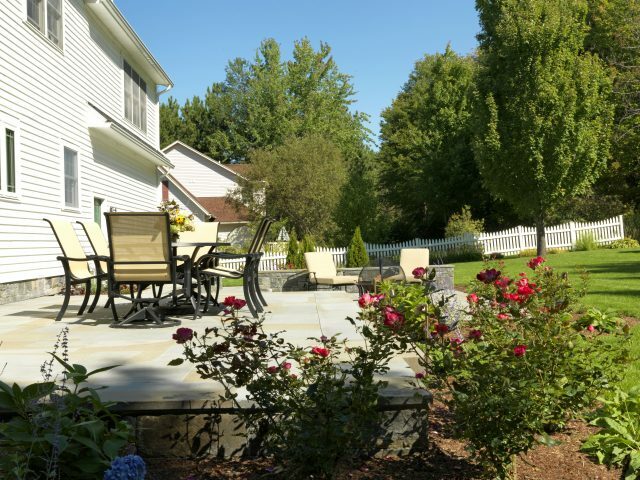 This bed and the ones wrapping the upper and lower patios contain a mixture of Endless Summer and Annabelle Hydrangeas, Knock Out Roses and mixed perennials which help to add interest to the landscape as well as color throughout the summer growing season. 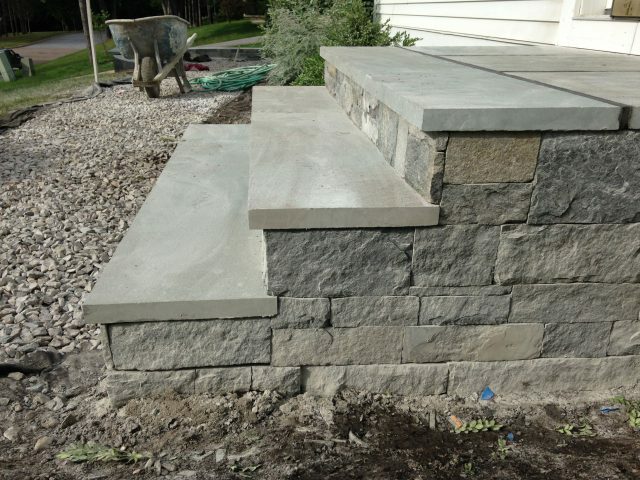 The homes exposed concrete foundation was veneered with Adirondack Granite to match the look of the walls. This really finished off the space. Lighting was also incorporated into this newly renovated outdoor entertainment area as a finishing touch. This addition really helps to prolong the use of this new area well into the evening. 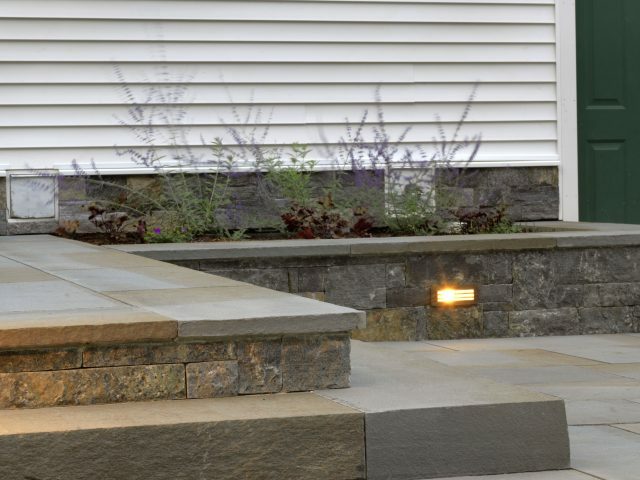 Path lights illuminate the step from the upper patio leading to the lawn and also add some light to the corner of the lower patio. 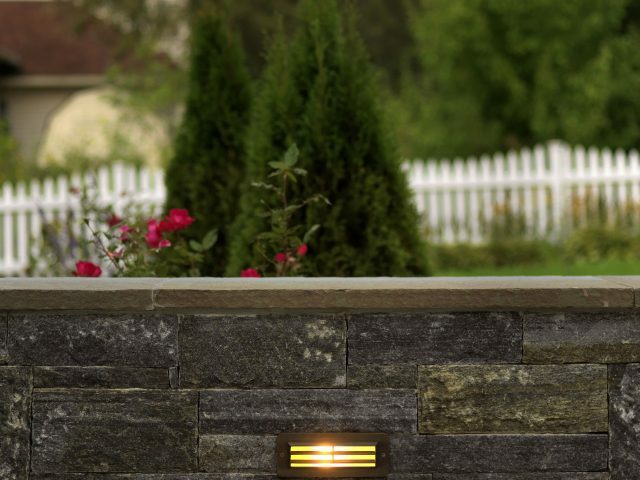 Lights were built directly into both the raised granite planter walls and the sitting wall to light the walkway and to provide subtle light for the lower patio. These lights give the whole space a warm and inviting glow that instantly makes the homeowners relax and unwind after a busy day. To deal with the drainage problems we installed three curtain drains and re-graded the entire back yard. The drainage pipes were connected together and the water was then piped to an existing swale that had been installed by the town the summer before. Sod was then installed over this newly renovated lawn to provide instant coverage and gave the area a crisp clean finish. Where once was a little used tired space, is now a welcoming, colorful and relaxing place to spend time. The homeowners have commented on how drawn they are to being out there reading the morning paper with coffee, lounging in the sun or enjoying a fire well into the evening.